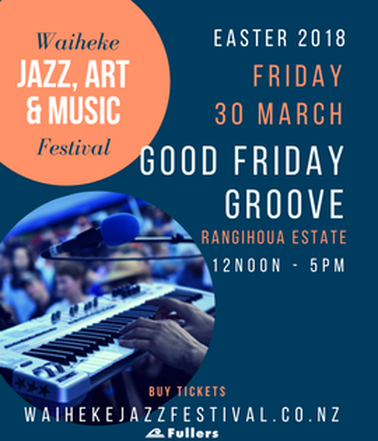 Good Friday Groove at Rangihoua. 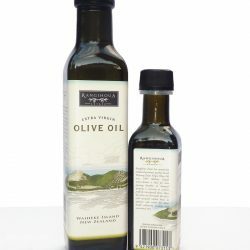 This is one of the highlights of the Waiheke Events Calendar and one not to be missed. 5 bands, 5 hours of fun. Hopetoun Brown (Jazz), Hipstamatics (up-beat soul), TALI (r’n’b), The Gipsy Kings Tribute band (8 piece latin band) and the Golden Kiwis (a Kiwi super-group, including members of the Dudes, Hello Sailor, Sola Rosa and the Narcs), playing back to back kiwi classics! 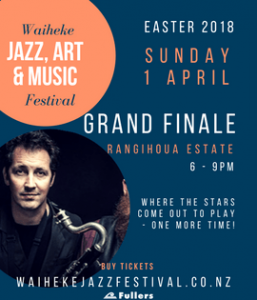 Part of the Waiheke Jazz, Art & Music Festival – Get tickets here. The Grand Finale is always a crowd pleaser and one of the most popular events within the festival. With a revolving lineup of bands, a beautiful atmosphere and always a great crowd – this is one event you really must not miss. The Venue is Licenced to sell Wine and Beer therefore no BYO. 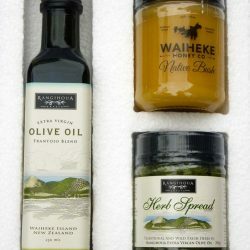 Local Waiheke Artisan Food Trucks will be selling Tasty Food to satisfy all taste buds. Limited Eftpos available, recommend to bring cash to avoid queuing.